Tickets can be purchased at the Fox Theatre and Little Caesars Arena XFINITY box offices and Ticketmaster.com. A limited quantity of VIP packages are also available. It is the tour policy that children under 1 year old do not require a ticket to sit on a parent’s lap, but all other customers do. For a complete list of on-sale cities and upcoming shows, visit pjmaskslive.com. The Very Important PJ Masks Meet & Greet upgrade features access to an after-show Meet & Greet photo opportunity with your 3 favorite Heroes, along with a PJ Masks souvenir bag and more. Click HERE for the upgrade. 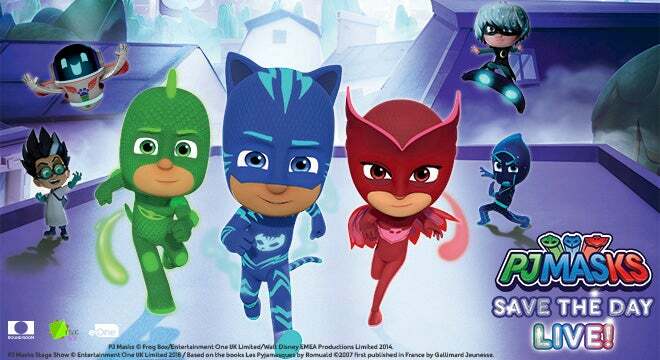 PJ Masks Live!, the hit live musical production from Entertainment One (eOne) and Round Room, is back with an all-new show, “PJ Masks Live: Save The Day!” at the Fox Theatre on Thursday, April 4 at 6 p.m. Based on eOne’s top-rated animated series, airing daily on Disney Junior, the new show features preschoolers’ favorite pre-school superheroes and familiar songs from the popular show along with brand new music and a whole new adventure. It is the tour policy that children under 1 year old do not require a ticket to sit on a parent’s lap, but all other customers do. For a complete list of on-sale cities and upcoming shows, visit pjmaskslive.com. Catboy, Owlette, Gekko will delight fans of all ages with live performances featuring world-class production, toe-tapping tunes and a whole lot of super fun as they go into the night to save the day from the Villains along with PJ Robot who is new to the show for 2019! For more information and to purchase tickets, please visit www.pjmaskslive.com. Here’s how it works: Meet & Greet Ticket purchasers should go to the check-in table prior to the event to pick up the Meet & Greet passes, bags and after-show instructions. Each adult and child (age 1 and up) in a group must have a Meet & Greet Upgrade. Patrons will be directed where to go for the after-show event. The Meet & Greet event will start shortly after the end of show and last approximately 30 minutes.